As 2015 set a record for the warmest year in over a century, extreme weather events wreaked havoc around the world. Many governments are still calculating the cost of floods, heat waves and droughts to their economies. The El Nino events in the Pacific Ocean impacted climate in many parts of the world. For example, South Africa suffered its driest year on record, which seriously reduced agricultural yields and forced many livestock owners to kill or sell animals. As climate change is increasingly affecting rainfall and temperatures, drier regions are faced with a growing problem of feeding more people under the least favorable conditions for agricultural production. Water resources, already under great pressure in these areas, will become more stressed particularly under drought conditions, undermining efforts to ensure food and water security, and agricultural sustainability. Arid and semi-arid regions like the Middle East and North Africa (MENA) are particularly prone to climate change-related effects. Finding solutions to cope with these looming challenges was the focus of attention at a joint panel discussion organized recently by the International Center for Biosaline Agriculture (ICBA), the US Agency for International Development (USAID) and the Food and Agriculture Organization (FAO) of the UN at the Global Forum for Innovations in Agriculture (GFIA). 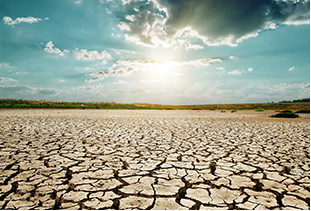 The event brought together leading specialists and scientists working in the MENA region to discuss how innovations can help to better manage droughts. Speaking at the event in Abu Dhabi on February 16, 2016, Ms. Setta Tutundjian, Director of Partnerships and Knowledge Management Division at ICBA, told the meeting about the impacts of recent droughts in the MENA region. “A severe drought is taking place now in Morocco, Tunisia and Algeria. Last month, the Moroccan government mobilized 417m euros to supply drinking water to remote villages, protect animal and plant resources. The agricultural insurance organization MAMDA also mobilized 116 million euros to reimburse affected farmers,” Ms. Tutundjian told the audience. Commenting on the impact of climate change, Dr. Pasquale Steduto, the FAO Deputy Regional Representative for the Near East and North Africa Region, noted that the region is forecast to experience higher temperatures and less rainfall. “In brief, the areas that are already dry will become drier, and the regions of the world which are already wet will become wetter,” Dr. Steduto remarked. According to Dr. John Wilson, senior environmental officer at the USAID Middle East Bureau, it is necessary to develop new approaches to drought management in the region. Above all, it is important to move from crisis management to risk management: taking measures before drought happens rather than dealing with its aftermath. As governments in the MENA region are finding out, responding to a crisis when it happens is much costlier than mitigating it. In response to increasing drought risks, ICBA has been leading a USAID-funded drought management program called MAWRED since 2009 to develop and improve climate, water and crop models more adapted to the conditions of the region and generate more accurate data to support decision-making at different levels, from farm to national and regional. In 2015 ICBA, USAID, FAO and the University of Nebraska - Lincoln joined forces to set up a MENA regional drought management system (MENA RDMS). This effort is aimed at achieving three primary goals. First, it will help to establish regional and national drought monitoring and early warning systems. Second, it will provide assessments of drought vulnerabilities and impacts. Third, it will support development of preparedness plans for responding to and mitigating the effects of drought. Dr. McDonnell also pointed out that as droughts manifest themselves differently in different areas, it is important to design approaches tailored to the characteristics of each area. While localized data will help to identify where attention is needed most, sharing knowledge and experience at national and regional levels is crucial. For example, crop failures in one country can disturb food markets elsewhere. So regional collaboration is important to identify risks to agricultural production in advance and take preventive actions. Droughts may happen in one country, but their effects often go far beyond.